At some point in your running career, you may want to increase your running speed and performance. One of the most effective methods to do this is by interval training. Interval training can be useful for sprinters, middle-distance and long-distance runners; it is one of the most effective ways to increase running speed. Remember, if you are thinking about improving your speed it is important that you first establish a good running base. Intervals generally start out with short all-out efforts, followed by periods of recovery. The idea is to increase these all-out-effort periods slowly over time according to your running goals. The key difference between repeat training versus interval training is the recovery period. In repeat training we allow full recovery; in interval training the recovery time is limited. The so called "interval" time is the time between runs spent recovering. The goal of interval training is to slowly "build up" time spent running at a very high levels, which increase our body's ability to run at a sustained anaerobic pace for longer periods of time. Over time, interval training helps us meet the multiple demands on the body when increasing race speed. The challenge and the benefit of running intervals are deeply rooted in controlling the recovery time, not running faster. In general you will be ready to ramp up your interval workouts when you have successfully run your current workout for three to four weeks. 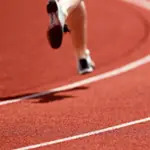 The physiological change resulting from pushing the body past its normal comfortable speed of running is increasing aerobic and anaerobic capacity and recruiting the use of fast twitch muscles. This enables us to operate at a higher and faster level and increasing tolerance to lactic acid build up. The actual translation of interval training is to steadily increase your comfortable running pace. Never underestimate the necessity of warm up and cool down segments, especially in interval training. Begin every session by warming up your muscles with 5-10 minutes of jogging. Cooling down after your workout is equally important, as it enables the body to remove lactic acid from the muscles, thereby reducing post-exercise soreness (or DOMS, delayed onset of muscle soreness). Cool down by jogging or walking briskly for 5-10 minutes. Standard Intervals: Running for a set distance followed by a set distance recovery jog. You repeat this fast run/slow jog recovery combination. As you improve, you can increase the number of sets performed. Pyramid intervals (a.k.a. ladders): A pyramid session is a variation of the standard interval session. You run in ascending or descending length intervals e.g., 800m, 600m, 400m and 200m. This would count as one set. You can build up the number of your sets as your fitness improves. Fartlek (meaning speed play): An unstructured session which involves varying your intervals. As the name suggests, you can also have fun and add in different types of terrain (off road, on sand, etc.) or even add-in power moves as your intervals (such as striding, hopping, bounding or running in varying directions). Hill Intervals: A hill interval involves running a hill gradient for a set period of time and then jogging back down as a recovery. Hill intervals provide a great cardio workout excellent along with strength training for the legs. Repeat for the desired number of times.